Which is what the supporters of Ny Nordisk Øl are fighting against – and although they don’t have many fellow travellers in the rest of Europe, it’s to be hoped that when other brewers start tasting the beers that Ny Nordisk Øl has inspired, it will spur them to produce ales that reflect their own places. Here are my notes on some of the “place-based beers” I tried in Denmark: An unlabelled (IIRC – although I may just have failed to record the name) ale brewed with sea wormwood (less bitter than the wormwood used in absinthe), camomile and sea buckthorn, three popular flavourings with Nordic brewers seeking to make a hopless ale. This had a lovely, deep, tongue-coating, very up-front bitterness, a pale, slightly cloudy appearance, a mouthfilling rotundity, and finally a sweetness under a full, vegetally/weedy flavour. 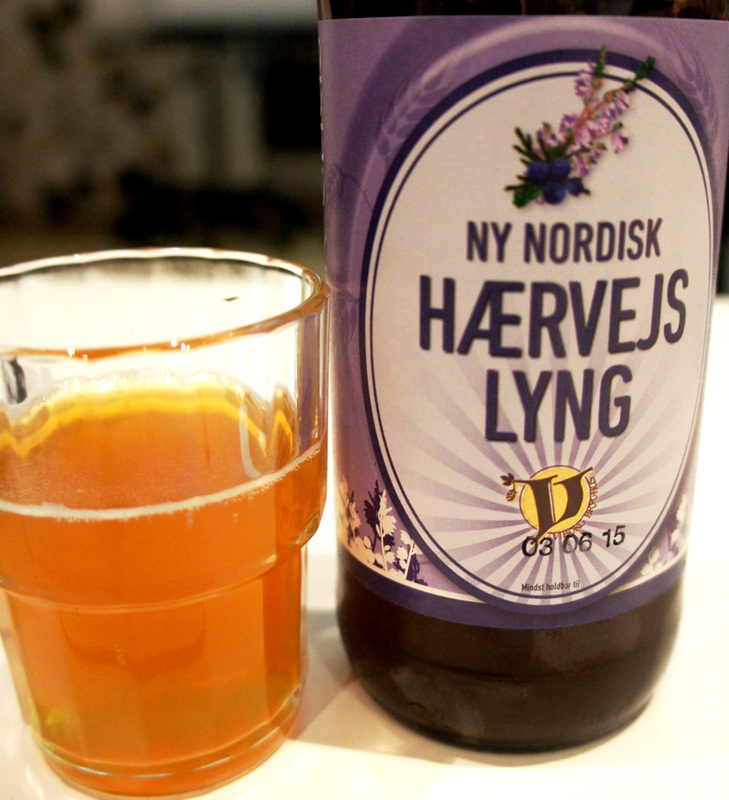 Ny Nordisk Hærvejs Lyng from the Vyborg Bryghus: a hop-free heather beer with a massive nose of honey, and liquid honey in the mouth but with a sharp tart lemony undertone, lightly petillant with no head. It’s alcoholic lemon and honey cough sweets. (The ale is named for the Hærvejen, or “Army Way”, a road that runs down the Jutland peninsula from Viborg to, eventually, Hamburg.) 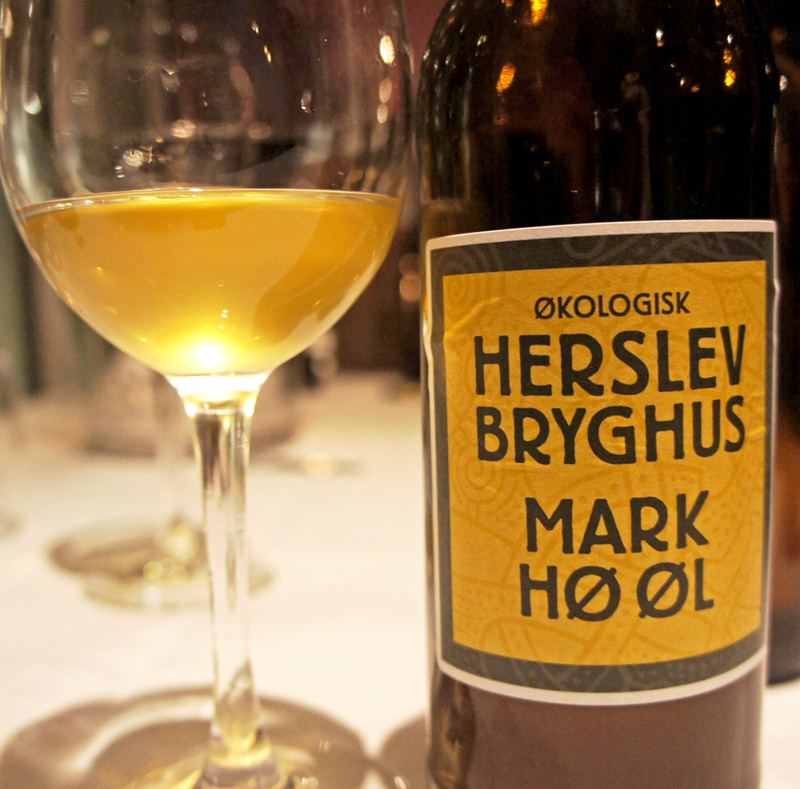 Mark Hø Øl (“Hay Ale”) from the Herslev bryghus. Made with hay from the field at the back of the brewery: hay goes in after the wort is boiled, and fermentation using yeasts and other micro-organisms in the hay is allowed to take place for two days. The ale is then boiled again, and a “combinational yeast” added – and more hay. The result is a sharp, pale, flat beer with a taste of what I can only call “fruity feet” – but in a good way. Hay is mentioned by Thomas Tryon as one of the flavourings used by English brewers in the 1690s, so hey! 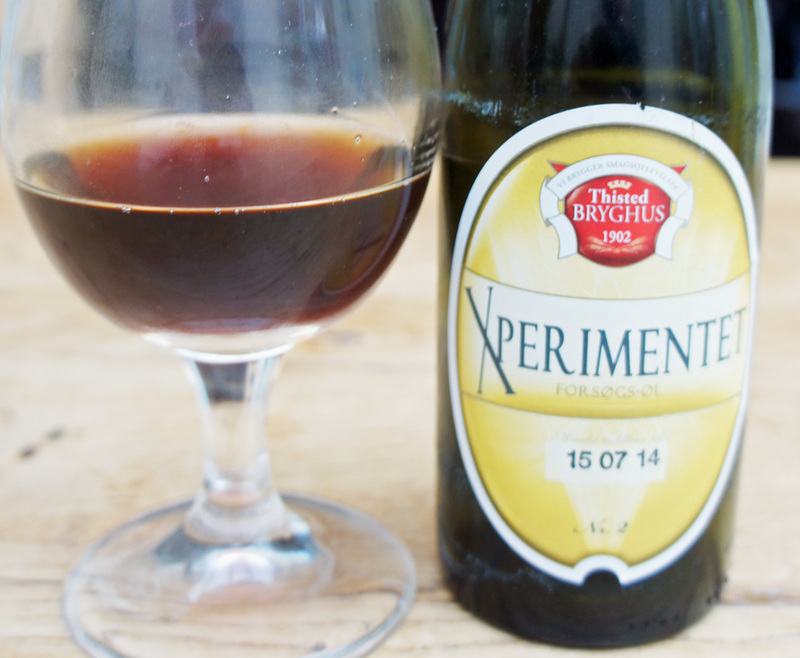 Any brewers in the UK with a big field out back of the brewhouse, here’s an idea … Thisted Bryghus Xperimentet 2, another hop-free beer with the bitterness provided by ingredients gatherer in the Thy National Park in North West Jutland, including rowan and sea wormwood (“rønnebær og strandmalurt” in Danish) and honey from bees who have been gathering nectar from “klokkeblomst” – literally “bellflowers, which I think means harebells in this case. (Trivia: “Klokkeblomst” is the name in Danish of Tinkerbell in Peter Pan.) Dark, strong (7.2% abv) and complex, it’s a drink with a deep and vegetal bitterness that rolls down the sides of the tongue and sits around the base of your mouth. 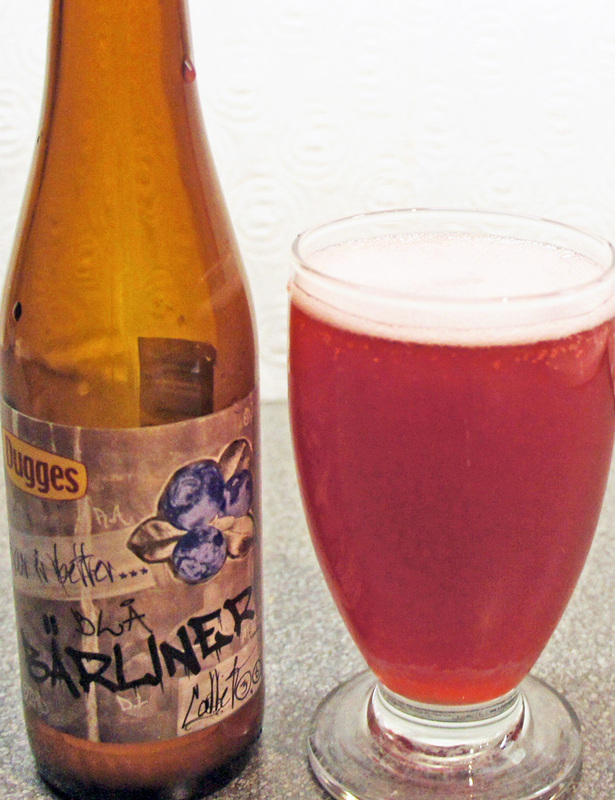 Bärliner from the Dugges Ale & Porter Brewery in Gothenburg, Sweden, three Berliner weisse-style brews, made without hops, but including lactobacillus from the malt to give acidity, and flavoured with, respectively, lingonberries, raspberries and blueberries. The name is a pun in Swedish: “Bärlin” means “Berlin” and “bär” means “berry”. The blueberry version, strangely pink, and hugely tart and sour, with the fruit hidden below layers of pucker, is never going to find a wide market: I see that one Swedish Instagrammer called it “Möjligtvis den äckligaste ölen jag har smakat i hela mitt liv”. The lingonberry version, a rather more orange-pink, is flatter and much less tart, with the fruit in the aftertaste. Fanø Bryghus Lynghvede (heather wheat ale) – brewed with orange peel, heather, chamomile . Heathery and honied with just a touch of Christmas oranges stored in an attic. Ebeltoft Mols Bjerge Brygget unhopped and slightly sour ale flavoured with heather and sea wormwood from another Danish national park, the “Mols Hills” in central Jutland, brewed by the Ebeltoft farm brewery with the help of Anders Kissmeyer. Slightly sour, not over-bitter, with a light perfume from the heather. Unfortunately I can’t tell you anything about any of the other presentations at the conference because they were all in Danish (the organisers were kind enough to say that mine was “”i særklasse fine oplæg”), but I was able to have some revealing talks afterwards with the delegates: I asked them if the Danish craft brewing scene resented the international attention given to Mikkel “Mikkeller” Borg Bjergsø, knowing what the answer would be, and I believe you know the answer as well. 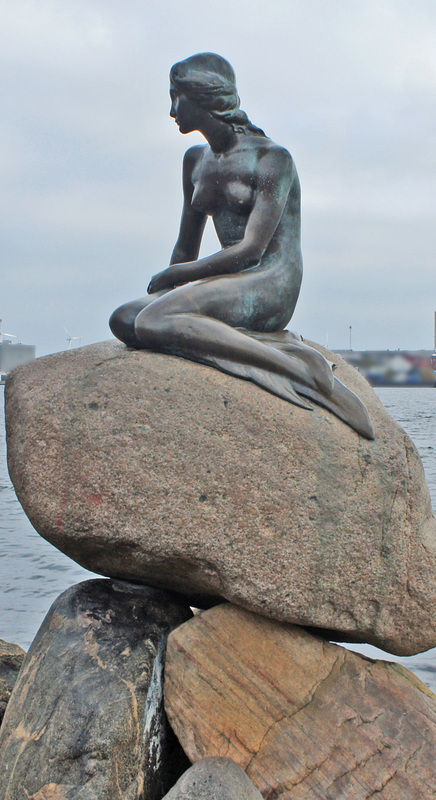 Still, the next day, I felt I couldn’t be in Copenhagen without (1) going to photograph the Little Mermaid and (2) taking a walk through the city to the original Mikkeller bar in Viktoriagade. It’s tiny and cramped, but as you can see from the picture of the interior, the line-up of beers is impressive: yes, that’s Three Floyds Dark Lord on the blackboard, which I never noticed until after I looked at the photograph on my phone back in England: I was too distracted by the collaboration beers on sale from a couple of my favourite British brewers, Siren and Wild Beer. Nice place to sit quietly and muse on the fact that the 11 per cent ABV Imperial stout you’re drinking cost DKr45 for a 20cl glass, which works out at more than £13 a pint: and on the other hand, it’s going down no faster than a pint of something a third of the strength would, while providing at least as much pleasure, or more. Good place to peoplewatch, too: the five Danish guys in their mid-40s on a table opposite where I was sitting looked the sort of solid private-business professionals I wouldn’t expect to see in a craft beer bar in Britain. 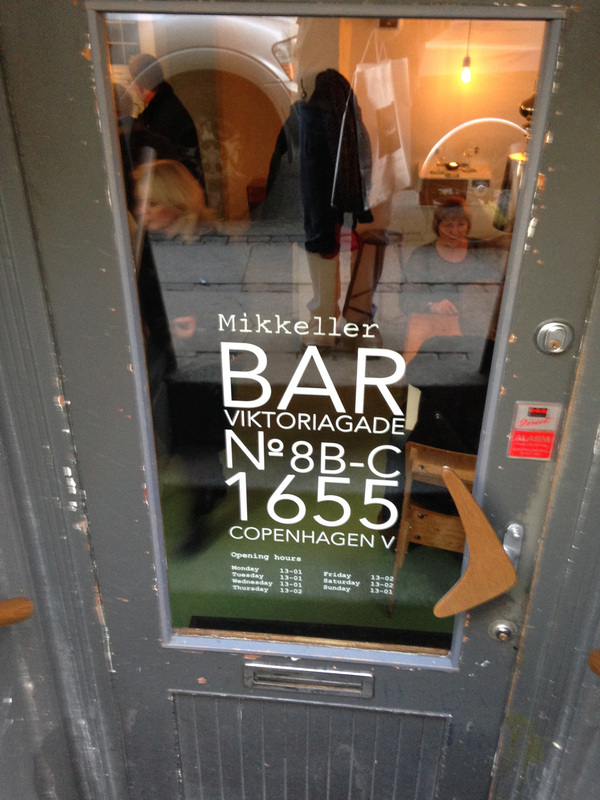 Later that evening I hooked up with Peter Myrup Olesen, one of Denmark’s top beer bloggers. 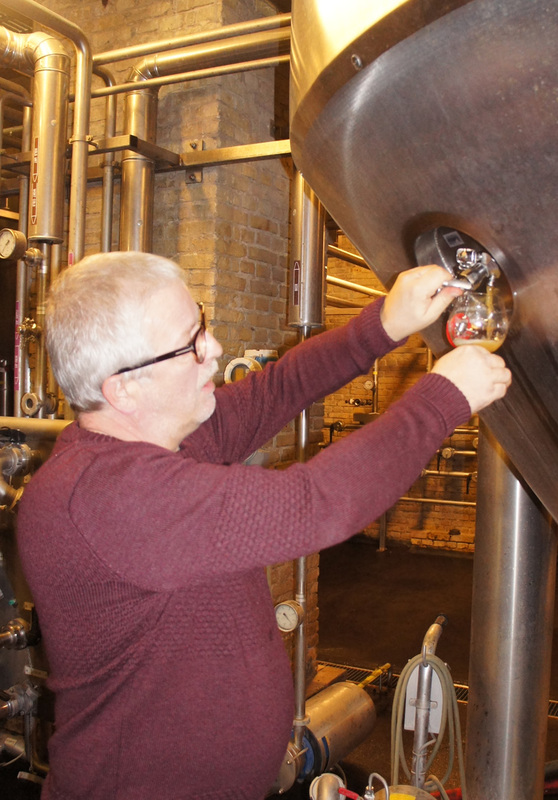 Peter is the man to turn to for top Scandinavian beer gossip: how Garrett Oliver is planning a second production plant in Europe for Brooklyn Brewery alongside the one opened in Stockholm with Carlsberg earlier this year, for example. 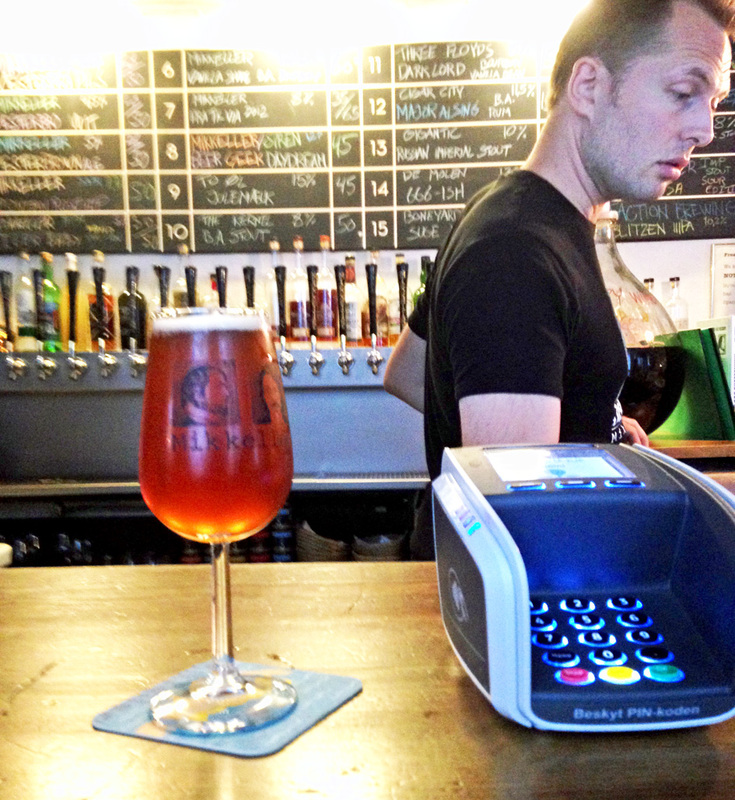 He very kindly took me on an informative tour round a trio of Copenhagen’s other top craft beer bars, Brewpub in Vestergade, Taphouse in Lavendelstræde, which claims its 61 taps is the largest number in Europe, and the newer, and larger, Mikkeller bar, Mikkeller & Friends on Stefansgade in Outer Norrebrø. This is not an easy venue to get to without a guide, but it’s a very interesting contrast with the Viktoriagade outlet: the customers are around 20 years younger, mostly, and rather more hipstery and studenty (it’s that sort of area), which meant I was probably twice the age of most of those drinking there, and three times older than some. 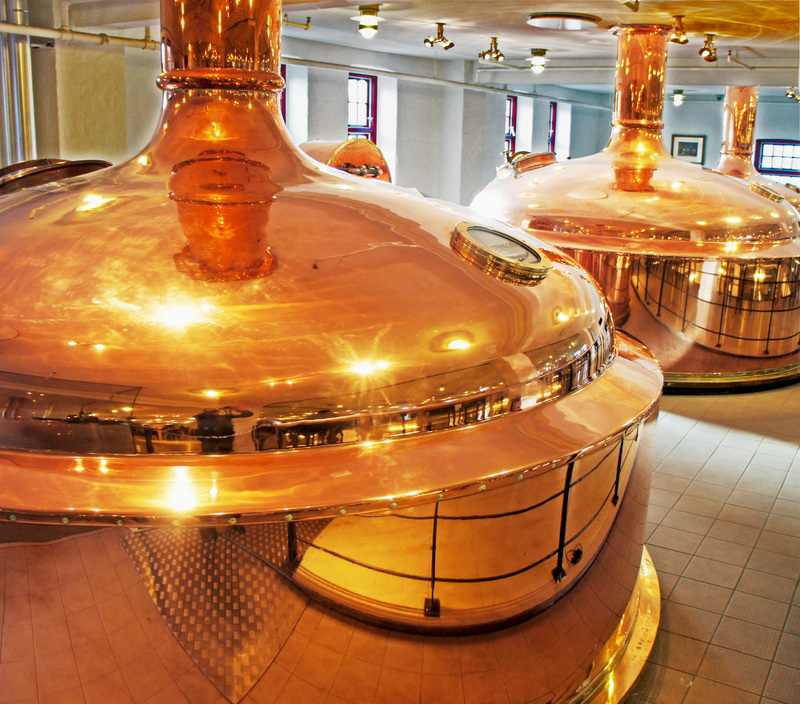 I was flying home the next afternoon, but a very nice man from Carlsberg, Bjarke Bundgaard, had invited me out to the Jacobsen Brewery, which is part of the Visit Carlsberg centre. Sadly, I didn’t get to see the records centre, but I did get to go down into the cellars of what was part of the original brewery, founded by JC Jacobsen in 1847, with one of the brewers who makes the specialist beers that Jacobsen provides for Carlsberg, Michael Rahbek, and, with Bjarke, drink beer straight from the fermenting vessels, and try some rarities stacked away behind doors normally locked – including Carlsberg Special from 2001. It was perfectly drinkable, since you’re asking, and actually tasted as if it would be very happy with another five years’ ageing. 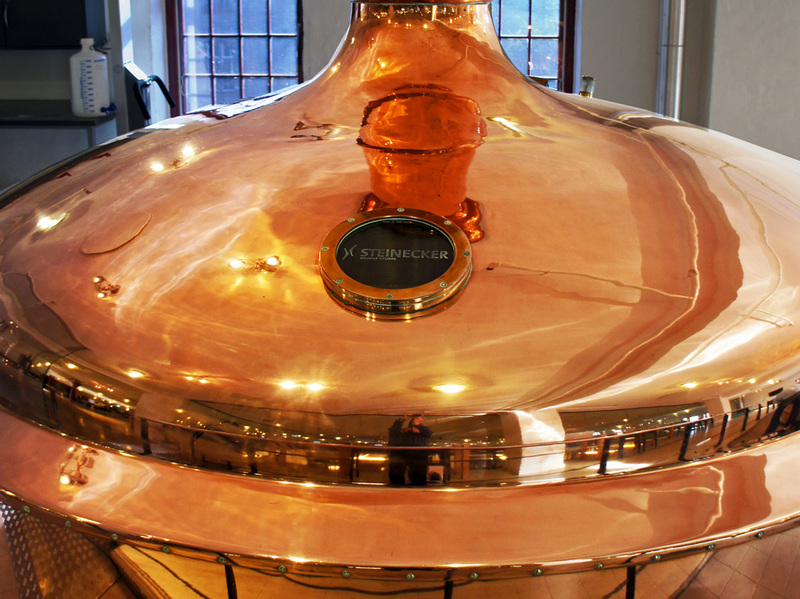 The brewery kit, up in the open part of the visitors’ centre, is spectacularly beautiful, all shiny-penny copper, though I noticed it took a couple of guys with polish and rags to keep it that way. Bjarke and Michael treated me to a Danish lunch on Carlsberg, and I talked about beer, beer history and beer styles far too much. 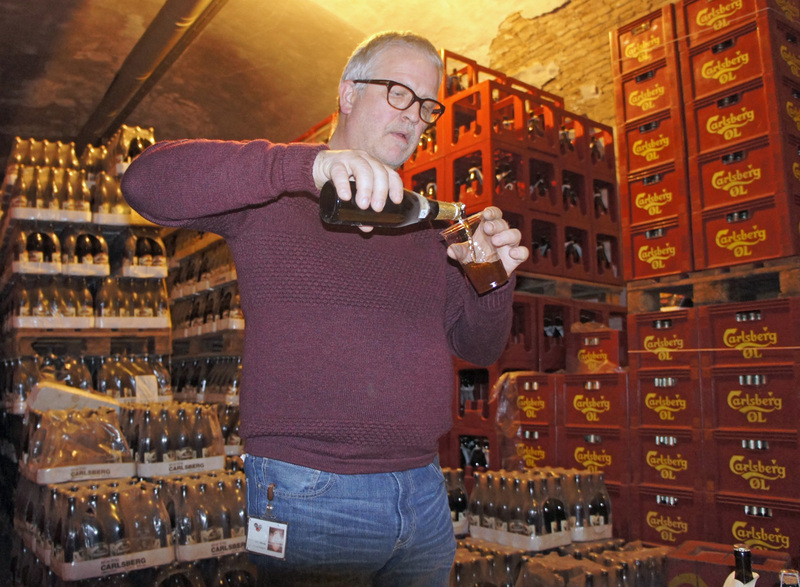 They did not seem to mind, however, since when I finally had to hurtle off to catch my plane, they loaded me with more than enough bottles of rare beers, including one of those 13-year-old Special Brews – more than enough to blow my baggage allowance, that is. Ach well … I had a wonderful time in Denmark, and I’m very grateful to all those who showed me such tremendous hospitality: Anders Kissmeyer and Christian Andersen, for inviting me over to talk to the Ny Nordisk Øl conference, Peter Myrup Olesen for the bar tour, and Bjarke Bundgaard and Michael Rahbek for their kindness in taking me down to parts of the Jacobsen set-up other visitors rarely see. Thank you all. How was the beer at BrewPub? I’ve had some lovely ones from them over the years, but their infected clanger ratio has been going worryingly up in more recent years. Place-based beers-dare I mention Newcastle? No, you daren’t. Not least because NBA is now brewed in Tadcaster. Hay or straw, Martyn? I have come across straw in the ash wheat beers in 1803 on the American frontier to break up the primarily wheat malt mash. Also, if hay how fresh? I think I’d fear a silage beer, fermented hay. 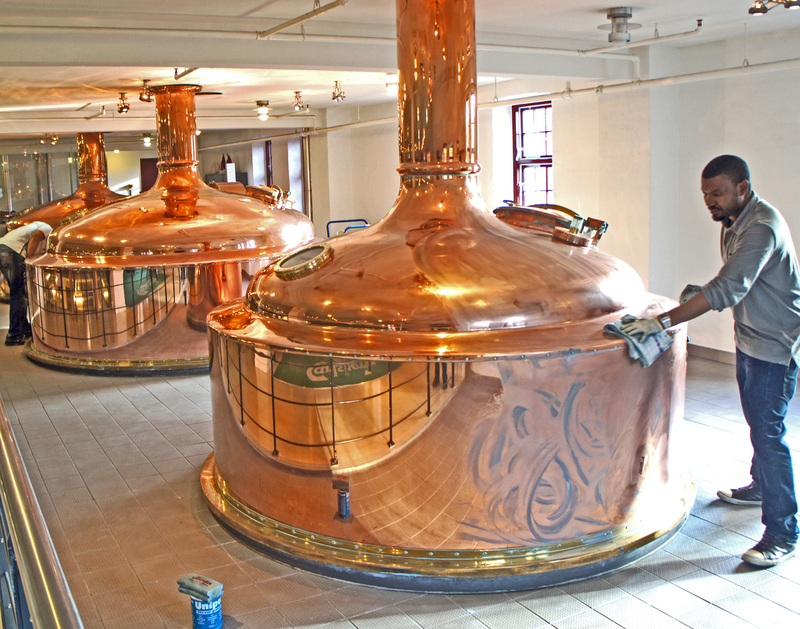 The “essence of here” is the perfect thing for a local brewer to capture. This trend in brewing, food and even specialty retail is the perfect antidote for the digitally and media enabled homogenization of the planet. Bravo! Thanks for the wonderfully well written post. Wish I had been able to participate in the research! Never mind. I see you left a comment on his “Farmhouse ales of Europe” post two weeks ago! Hi Martin. A shame I didn’t know you were coming – I would definitely have bought you a beer! I’m not certain I follow your thought processes here. You seem to revel in the idea that people are using local products but all they appear to be doing is making bog standard pale ales and flavouring them with weeds they find in the countryside. Truly local “terroir”, as you state yourself, would be brewers using ONLY local barley, malting it themselves, and then using standard unmodified local water profiles and hops grown in their country from heirloom varieties (not growing cascade in Denmark and presenting it as local). Using local “weird” ingredients to flavour bog standard globalized micro-brew is, in itself, nothing to be overly proud of. Its like putting local fungi, berries and herbs on a pizza and congratulating yourself for making a local dish. It’s ingratiating.